There’s no better way to celebrate a scorching hot 4th of July than with a fresh batch of homemade ice cream…..which is exactly what we did yesterday! I’ve had several friends request this recipe that I’m sharing with you today. You may be getting this a little too late to include in your 4th of July celebrations, but lucky for you, July is National Ice Cream Month! I seriously need to hug whoever thought that one up. 🙂 Ice cream is my number one weakness of all time. I eat it almost everyday – at least once! This recipe comes from a cookbook by Thomas R. Quinn called “Old-Fashioned Homemade Ice Cream”. My mom picked this up for me at an Amish store in Holmes County, OH a couple of years ago. These recipes are simply the BEST homemade ice creams that I’ve ever had in my life. Leftovers freeze amazingly well (anybody ever had the kind that turns hard as a rock when frozen in the freezer?) and scoop out just like store-bought ice cream. In a large pan combine the sugar, eggs, and salt. Add the whipping cream and cook the mixture over medium-low heat, stirring constantly to avoid scorching. Remove from heat when the mixture coats the back of a spoon (about 180 degrees). Refrigerate. When cool, add the vanilla. If using fresh strawberries, either dice strawberries into very small pieces or slice and mash them. Add the lemon juice and enough sugar to sweeten (about 1/4 cup). Refrigerate at least 1 hour to allow the sugar to blend with the strawberries. 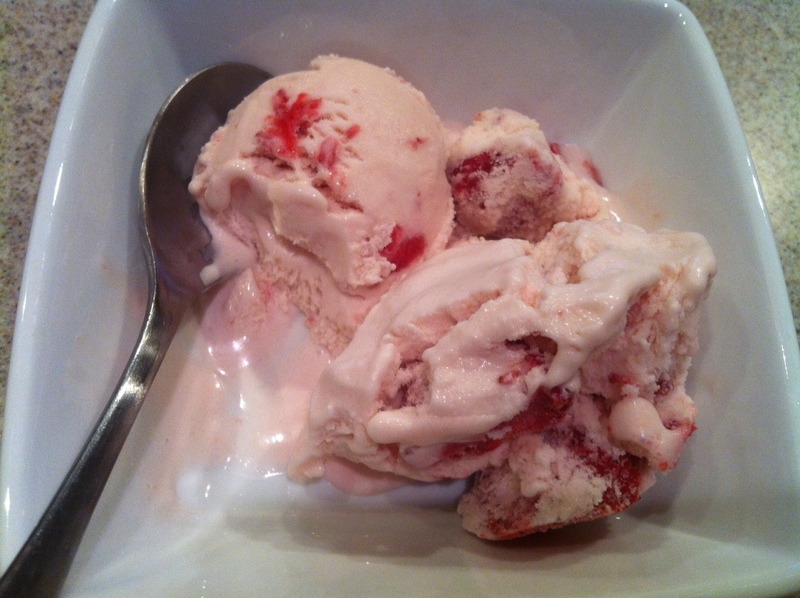 When ready to freeze ice cream, add the strawberries to the cream-sugar-egg mixture. Pour into an ice cream freezing can and add whole milk to bring the mixture up to 3/4 full. Freeze in a home ice cream freezer. Makes about one gallon. 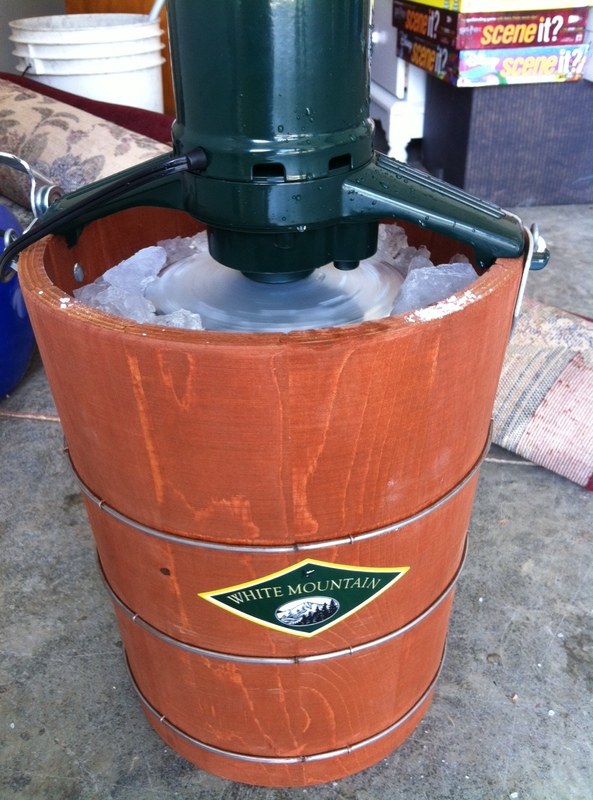 Note: I use a 6 qt White Mountain ice cream freezer so I don’t fill to 3/4 full because this recipe is written for a 4 qt freezer. Also, I used raw milk from our cows which has a bit higher fat content than “whole milk” so I used 2 1/2 cups of whipping cream and 5 1/2 cups milk to compensate. In addition, I added the milk at same time I added the cream and cooked to 180 degrees. This is not necessary to do – I’ve made it both ways – BUT I felt this may have given the ice cream an ever creamier texture.